Self-employed People always face some challenges about maintaining account records for income tax and pay income tax on time. Self-employed people in generally have a busy schedule and fixed time-table. The income tax department made it easy for the self-employed from the financial year 2016-17. 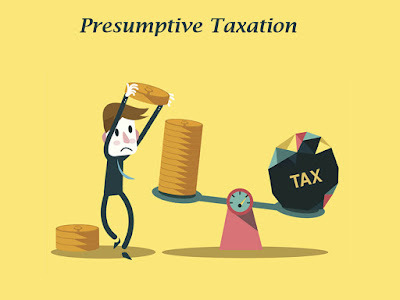 Presumptive means assume as professionals assume the income of the financial year on roughly basis and needn’t to audit all the accounting books for calculating the income for the financial year. This scheme was earlier allowed to business who files their income tax return in 4S SUGAM. Business turnover up to Rs. 2 Crore can opt this scheme and file itr 4S. Simplicity and easiness of this scheme attracts income tax department to act it on professionals and freelancers too as they can now more concentrate on their work by opting this presumptive scheme of income tax. Income tax department inserts a new section 44ADA in income tax act to introduced presumptive income for professionals. The details of this scheme are as under. - This scheme is available for those professionals who do not work with an employer like Doctor, CAs, Engineers, Architects, and Interior Decorators etc. - The limit is Rs. 50 Lakh for the financial year. If total receipts for a financial year is Rs. 50 Lakh or less, you can opt this scheme. - Income will be treated 50% of the total receipts and income tax will be calculated on that 50%. - In income tax return the presumptive income doesn’t require to show details of expenses. - Professionals who opt this scheme must file their income tax return in ITR 4S instead of ITR 4. - No need to keep formal accounting records. - You can claim deductions of various sections of income tax like section 80C, 80D, 80E,80U etc. - Total income will be 50% of total receipts plus any interest income. - This scheme is optional. If you think the expenses are more than 50% or 50% is very low for expenses you can still keep accounting records and files income tax return in normal way in ITR 4. In this format you can claim all your expenses by maintaining account records and submit profit and loss account. In the case of Presumptive Tax for Self employed person. Is Tax Audit applicable ? if yes, for what amount of Income ?